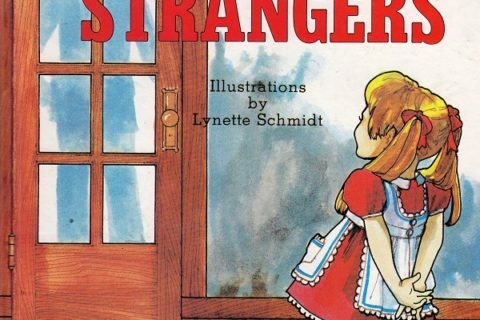 Did you know bad strangers are everywhere and are trying to get you? And you can’t recognize them…. they are everywhere. This book isn’t too bad considering its age. It is a bit creepy for the illustrations. All of the bad guys (and they are all guys) look like they are pedophiles. 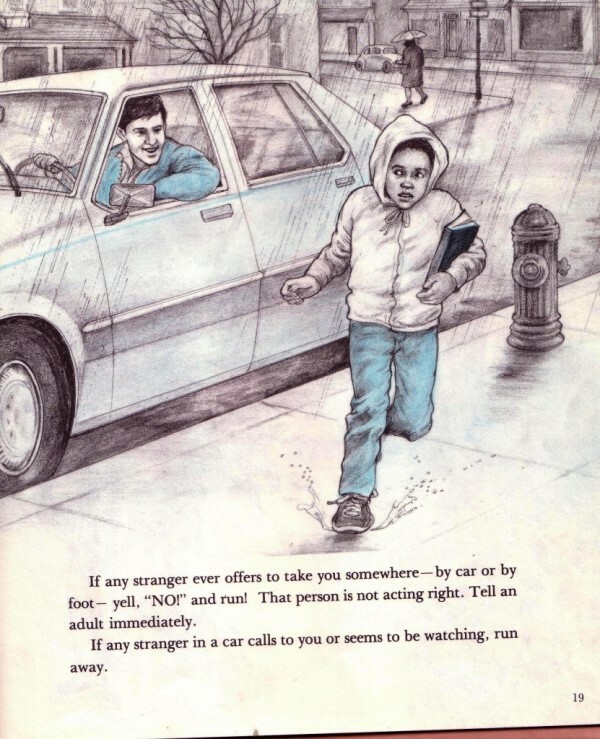 Stranger safety is important, but I find this book a little heavy on text. There is more scare than information in my opinion. Pedo = a man with a blue shirt. Floating around the Web somewhere is a list of the top 5 dangers to children according to statistical data vs. the top 5 dangers parents worry about. One or more things that boil down to stranger danger can be found on the parents’ list, but not on the list of things that actually harm the most children. On the real-danger list, but not on parents’ radar? Car accidents and drowning. I thought one of the weirdest things was the pictures. The illustrator can draw incredibly realistic, perfectly proportioned people, but apparently she couldn’t draw a car to save her life. 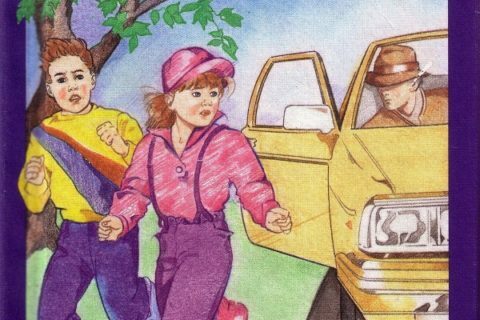 The first and last pictures are passable (though there was never a car as short and tall as the red one, especially not in the early 1980s), but the third picture looks like some kind of failed Drawing 101 project. It’s like the cars were drawn with cartoon proportions and then placed into a detailed, realistic picture at the wrong size (all the cars are clearly compact cars based on the designs, but they are the size of Hummers). I know that’s not something anyone would care about, but it is driving me crazy. Watch out for them dudes in blue shirts and 80’s style suits who hang around women’s washrooms! They are bad news! Jenny, I think that list is from the Paranoid Parents people. Oh my God! 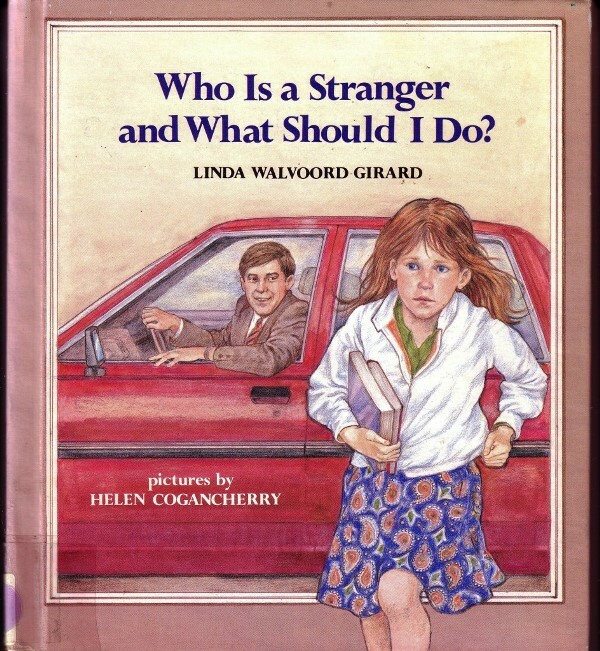 I had this book as a kid! Read it religiously! To this day I’m still kind of afraid of strangers! RUN! It’s a Republican Congressman!!!! 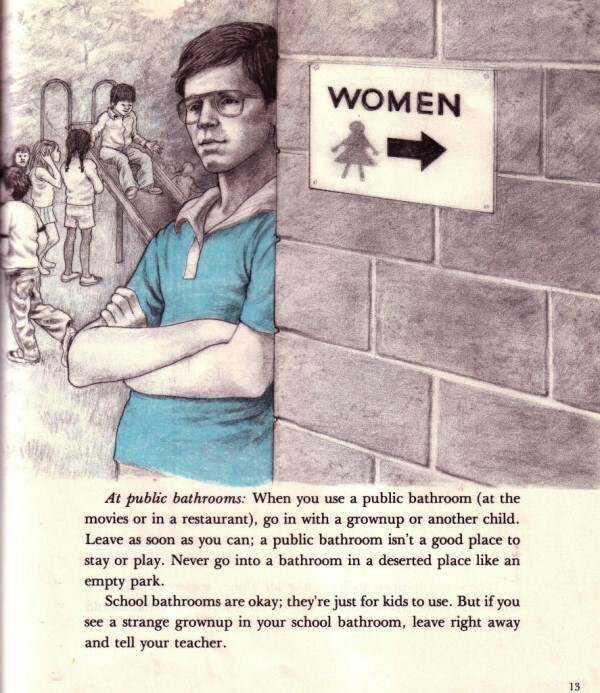 The fact that it gives advice (Don’t go into a restroom in a deserted place is one I haven’t heard before) puts it in the upper quartile for me since many of them are thin on practical information. On that subject, go to www . archive . org and search for Sid Davis. Any film he made was this sort of thing in motion picture. They’re all also awful, so some of you might recognize some of your reel-to-reel holdings! For Leslie: It was once cheaper (and may still be) to produce books with only three colors than full spectrum. That’s why so many older picture books have such muted color palates and seem so boring to us now. I think it’s unfair to single out Republicans in that context. I agree about the car drawing ability though. where is the back of the 2nd car? even if it’s a hatchback, (and accounting for perspective and foreshortening), the rear tire should be at least partially visible. 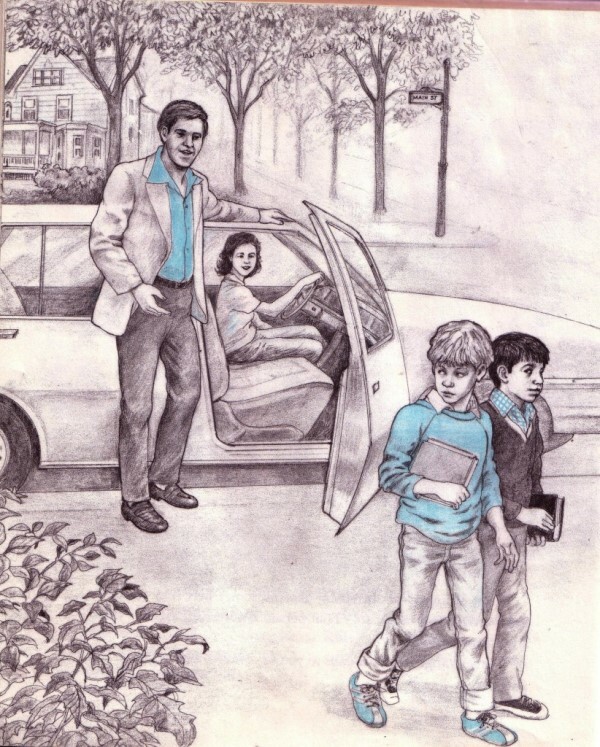 That woman in the car looks suspicious, and perhaps should be wearing blue too. Is that Warren Beatty hanging around outside the women’s bathroom? The advice in this book seems pretty good, but I’m a little perturbed, since I’ve worn a pale blue shirt numerous times in public this year – will this put me on some sort of register? 1) Don’t go to the bathroom with a guy wearing glasses that are an optical illusion. 2) Don’t get into cars that only have front wheels. 3) Don’t get into a car with a car with a man who has one leg that is significantly shorter than the other/rides an invisible skateboard. I bet the woman on the car is supposed to be Myra Hindley ?